As the head of Save the Children, one of the best parts of my job is getting to meet amazing children, in the toughest places around the world, who are working to make it a better place. Maryam Ahmed one of these children. 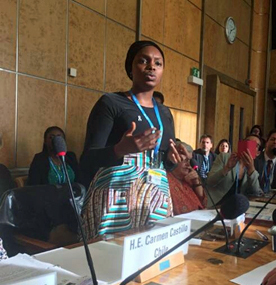 She is a Save the Children Girl Champion, 17 years old and born in Kano State (North West Nigeria) where she is a child right’s activist and a member of the Abuja Children’s parliament. Maryam is an advocate for girls’ education, ending child marriage, and combatting gender-based violence. I am thrilled to have Maryam write this blog with me, in honor of International Day of the Girl. This week, we are together in Washington, D.C, meeting with influential figures on Capitol Hill and the U.S. Administration to discuss the importance of investing in girls and asking U.S. policymakers to continue leading on issues such as tackling the barriers girls face in getting an education. Girls are too often barred from the opportunity to learn – limiting their lives and risking their futures. 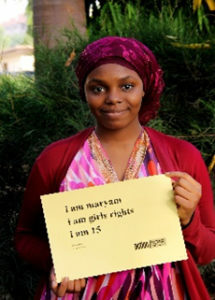 I, Maryam, am proud to be a girl from Northern Nigeria who is still in school. This is not something you see very often. In my community, only 4 percent of girls get to finish secondary school. While this number may sound staggering, unfortunately it’s not uncommon around the world. Globally, girls are 3 times more likely to be out of school than boys, putting them at risk for child marriage, pregnancy, and trafficking. Without education, the world’s girls will be left behind. That’s why today and every day, we’re recognizing that girls are worth more – worth educating and empowering. And that is why we both are dedicated to advocating for gender equality and girls’ rights. Back at home in Nigeria, for example, there are laws and policies in place to prohibit child marriage, but customary norms and practices continue to violate our rights and no proper action is taken to address this. So I promote the rights and the well-being of girls while providing advice on how everyday citizens can help be a part of the solution. I also wrote and recorded a song called “I believe,” to elevate the voice of children, especially girls. The song is a reminder that investing in adolescent girls is not only the right decision, but the smart decision and also to inspire girls to be anything they want to be. Investing in girls yields amazing results, and education and empowerment is our best bet for keeping them on the path to success. By advocating against child marriage and inequality, we at Save the Children aim to influence U.S. leaders, Nigeria’s leaders — and the world’s leaders — to help girls get the opportunities that every last child deserves. Together, we’ll empower every last girl to realize her dreams. We invite you to join us at savethechildren.org/girls and to share this blog with the hashtag #ShesWorthMore.